The 300 sedan series remains a popular choice among vehicle owners, as the cars epitomize the tradition and quality manufacturing of the Chrysler brand. The models introduced for this year are no less impressive. See them at our Chrysler sales facility. New Chrysler 300 sedan owners have the option of choosing between eight different body colors. Express yourself by selecting your favorite. The overall body design of the sedans features gentle curves and discreet molded lines to create a no-nonsense image of elegance. The Sport is a base trim on the 2020 Gladiator's lineup. You can make an upgrade to the Sport S edition if you have extra money to spend. The Overland is a mid-level trim that has plenty of convenient amenities and robust mechanical features. Although the Dodge Charger is a car that has quite a bit of speed and a sporty appearance, there are a few features available that will give you the smoothest drive while on the road. The Blacktop Package is one that features a blackout design. The windows are tinted, and you'll notice that almost all of the details inside the vehicle are black. The Charger Plus package is one that offers more comfort while you're on the road. The wheels are larger, and the seats are made of comfortable material. Front and rear seats are heated. The new Jeep Renegade is a popular and powerful midsize SUV. Like many of its Jeep predecessors, the Renegade includes many features that are designed specifically for off-road experiences. Included in this list of off-roading chops are specialized low gear ranges as well as exceptional ground clearance ratings. Many off-road conditions require vehicles to negotiate steep, muddy, or otherwise hostile terrain. The Jeep Renegade does this easily with the specialized Jeep Active Drive Low 4 x 4 technology. One of the most popular mid size SUVs on the road today is the Dodge Journey. Its top notch performance and incredible design make it stand out among its many competitors. That is why our team of SUV experts here at Lithia Chrysler Dodge Jeep Ram FIAT of Eureka are so excited to announce the arrival of the brand new 2018 model! Are you considering the Jeep Cherokee? At Lithia Chrysler Dodge Jeep Ram FIAT of Eureka, it is a popular model with our consumers because it comes packed with a number of innovative features. In the Jeep Cherokee, you can enjoy interior features that provide you and your passengers with plenty of comfort and entertainment. 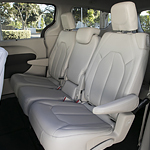 The new Cherokee's interior has a number of all-weather features that keep everyone in the cabin comfortable. This model offers an available heated steering wheel and heated and ventilated front seats. Chrysler's 2019 edition of the 300 boasts advanced infotainment and internet features that leverage today's smart technology. With Chrysler's Uconnect 4C NAV and supporting technologies like a built-in Wi-Fi hotspot, you'll find that the 300 integrates seamlessly with today's mobile devices. The Uconnect 4C is Chrysler's innovative infotainment center, which comes equipped with an 8.4-in touchscreen and support for Android Auto, Apple CarPlay, and voice commands. It also includes Bluetooth audio streaming and the SiriusXM satellite radio service. Now that the new Jeep Wrangler has arrived on the lot here at Lithia Chrysler Dodge Jeep Ram FIAT of Eureka, we thought this would be a great time to show why safety features make this popular compact SUV the one to own this year. Why Should You Choose a Drop-In Bed Liner? Every pickup truck needs a bed liner. Picking out a bed liner can be overwhelming because there are many types to choose from, ranging from outdoor carpet material to rubber mats, available aftermarket manufacturers or directly from truck manufacturers. However, just two types of bed liners are available directly from truck manufacturers: the spray-in liner or drop-in liner. A drop-in bed liner is a form fitted plastic sheet that is "dropped in" to the truck bed and fastened with bolts. This type of bed liner can protect the entire bed or only protect the floor.